Along with all you do-gooders and entrepreneurs; parents who are hustling hard for a brighter future for your families!!! Last week was a great week because of how my less conventional diet changes have worked out. Note that I’ve done this all under the watchful eye of my doctor, so don’t try this at home, but I did try this twice before, suggesting to my doctor we try this out more regularly. Admittedly, I don’t know the science but again, my doctor recommended intermittent fasting and time restricted eating after I learned UFC world champion Georges St. Pierre was doing the same to treat his colitis. We’re not on the same level, but I’m naturally high stress and I train a bit: 4 times per week (twice Crossfit and two or more Brazilian Jiu Jitsu). 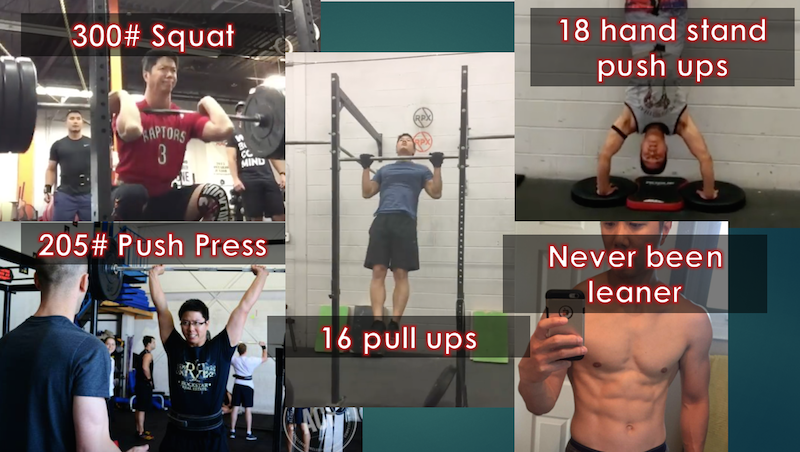 Knowing the science or not, last week was test week at our Crossfit gym, we tested: front squat, push press, strict hand stand pushups and strict pull ups. I set personal all time bests in each movement. My previous best front squat was 265 pounds, test results = 300 pounds. Hand stand push ups, five weeks ago I did 13, last week 18 (one lower than the gym record and tying gym owner, Dan, who is one of the best athletes I’ve ever met), push press 205 pounds and 16 strict pull ups. Also I had some great sessions at Brazillian Jiu Jitsu, I still lose (quite badly) to the better practitioners, but I scored two submissions. Overall, I am the strongest I’ve ever been while only doing Crossfit twice per week, I’m only one pound heavier and I appear to have less fat. I may not understand the science, but I’m more than happy with the results. At my next appointment with my doctor, I’ll be asking if we can increase the fasting periods, as the schedule I currently follow is considered one of the easiest. Does is seem like Amazon is everywhere? They sure seem to be creating jobs in the thousands each time they are in the news: 3,000 jobs in Vancouver and, more recently, announced another 1,000 in Ottawa. I’m fasting on Amazon, along with breakfast, but I can’t help but buy lots of books on my kindle, as I love reading it to fall asleep each night. But our household still buys tons off Amazon: phone cases, organic coconut milk, belts, hard drives, nail clippers, web cam, microphones (I simply look around my desk and sadly see hundreds of dollars spent buying off Amazon! LOL). The Amazon marketplace is often the first place I look to shop, for convenience and home delivery. That’s where this week’s episode comes in as my friend and client, Kensen Wah, took the deep plunge to leave his successful career at a big bank to start his Amazon business and he’s here on the show to share how he started and his progress.